NACBI members are now better able to help building owners and managers detect and document hidden moisture in flat, or low slope insulated commercial roof systems by performing aerial infrared scans throughout the United States. This is particularly helpful in keeping costs reasonable for clients or building owners of very large roof surfaces, multiple buildings or large campuses, or buildings with roofs that are difficult to access or scan via foot. Aerial IR inspections for commercial roofs are a time-saving and non-destructive diagnostic method that can be used to accurately and efficiently find hidden moisture in client’s roofs. Accurate results ensure the most cost effective, proactive, reliable and long-term solutions to provide Arial Thermal Imaging Services that are more cost effective than organizing and implementing fixed wing or other manned aerial services for similar purposes. The UAV is equipped with an infrared camera, providing high image sensitivity and accuracy in a 640×480 radiometric imager. The UAV (drone) mounted infrared camera provides real time radiometric data streamed directly to the ground control station during flight. 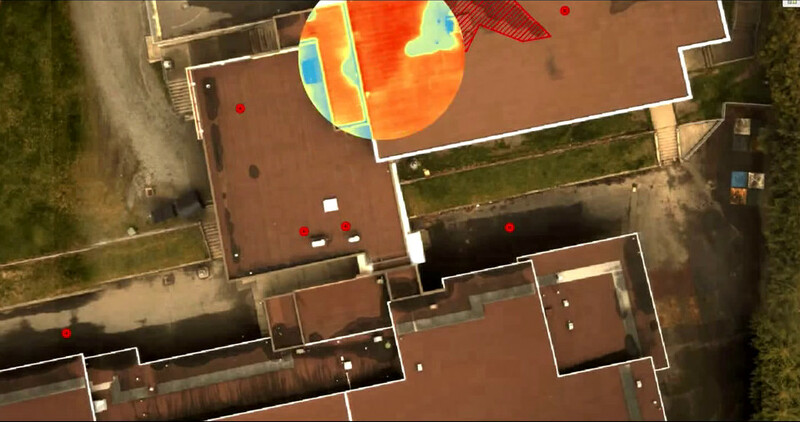 Images are captured in flight approximately 40 to 60 feet from the building envelope, and 50 to 200 feet above the roof. The aerial images acquired during flight for each project are converted into highly precise orthomosaic results for a wide range of analysis. The image (left) is an example of a finished orhtomosaic infrared flat roof inspection compiled from a series of infrared images taken of the subject commercial building using the UAV mounted Infrared Camera. The UAV is professionally operated by licensed pilots in compliance with current FAA rules and regulations for unmanned aerial vehicle commercial operation.